"Yes, I live in Fort Worth, and yes, I love fish tacos!" Place tilapia fillets on plate and sprinkle with salt and hot sauce; cover and refrigerate while making cilantro cream sauce. Combine cream cheese, 2 tablespoons cilantro, mayonnaise, and yogurt in a small bowl or large measuring cup; mix well. Stir lime juice into cream sauce. Cover and refrigerate. Whisk flour, salt, garlic powder, cayenne, and pepper in a bowl until thoroughly combined; whisk in beer to make a smooth batter. Heat oil in a large, deep frying pan to 375 degrees F (190 degrees C). Remove fish from refrigerator; dip in beer batter and fry fillets 3 at a time in the hot oil, turning when golden (approximately 2 minutes on each side, depending on the thickness). Transfer to paper towels to drain; set fish on a covered plate to keep warm. Repeat with remaining fillets. Wrap tortillas in a clean kitchen towel and heat in the microwave until warm, about 20 seconds. 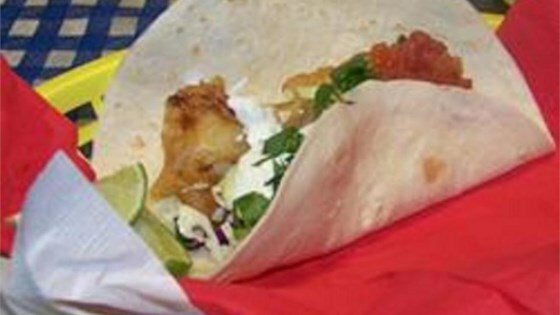 Assemble tacos by placing a fish fillet on a warm tortilla. Top with shredded cabbage, a dollop of cilantro cream sauce, a spoonful of salsa, and a sprinkle of chopped cilantro. Serve each taco with a lime quarter for squeezing. You can use any firm white boneless fish fillets in this recipe. I recommend frying in peanut oil for flavor, but you can use canola oil instead, or a combination of the two. To save time, you can use a bag of ready-to-serve shredded cabbage. Not the most healthy meal but it was very good. Followed the recipe exactly. Good basic recipe . I would probably mix the sauce and cabbage next time to make a slaw. Over all pretty yummy! I just made this recipe but served it with my own sauce recipe that I can't do without. I have to say that this is the best beer batter recipe I have ever found. Perfect ! Thanks for sharing. I have never had fish tacos before and this recipe had me wondering why. We made this for my entire family and it was loved by all! I can't wait to make again!